Ofcom's top tech bod, Mansoor Hanif, recently gave the Wi-Fi industry a roasting, telling them to shape up to 5G or face sliding into irrelevance. 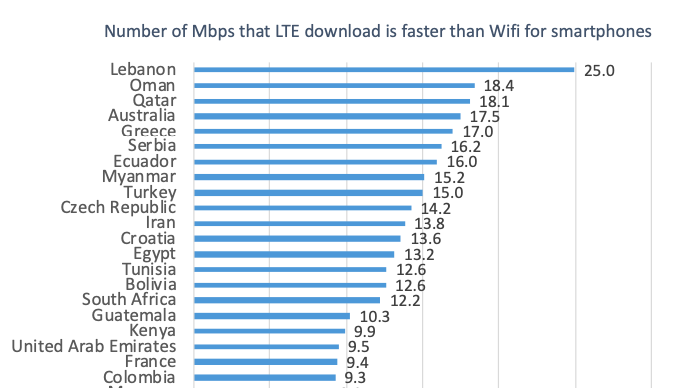 New network data from around the world shows that slide has already begun. 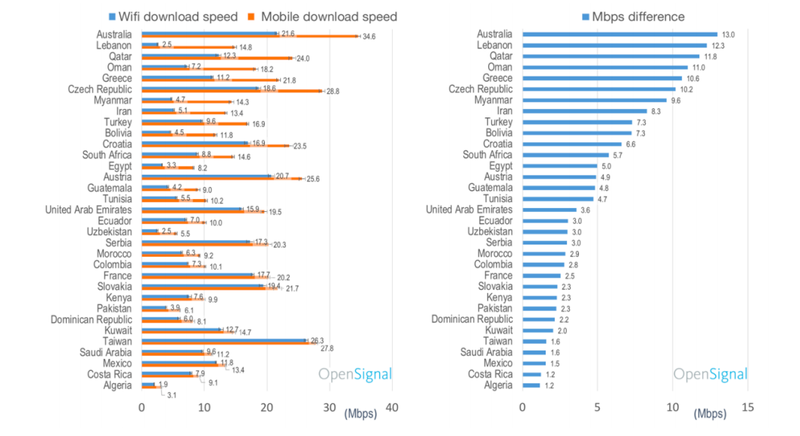 OpenSignal has found that mobile networks already outpace a customer's Wi-Fi connection, on average, in 33 countries. These range from Australia, where cellular is 13Mbit/s faster than Wi-Fi, to France, where its 2.5Mbit/s faster. In Singapore, Hong Kong and the US, the more expected pattern establishes itself, with Wi-Fi connections much faster than mobile (34 Mbits, 38 Mbit/s, 25 Mbit/s respectively). Ian Fogg, VP of Analysis at OpenSignal, urged mobile networks and smartphone platforms to rethink some basic assumptions. Currently a phone gloms onto a Wi-Fi network whenever it can, assuming this provides the user with a superior internet connection. But increasingly, this not the case. All things being equal, more phones will be pushing more users to a worse experience. Huawei this week further illustrated the case for abandoning home broadband over 5G, something called 5G-FWA – we discussed the state of the art, and the pros and cons, here this week. But, wait! There's a natural tension here for networks as 5G emerges. Every network is a constrained resource: if someone else's is less constrained than yours, why not dump traffic there? Offloading the traffic onto a decent Wi-Fi connection makes sense for an operator. And it might be a necessity for a while. As Dean Bubley of Disruptive Wireless told us this week, ensuring good coverage indoors in 5G's early days will almost be as complicated as calling up the Cable Guy. "At 26/28GHz, there will need to be an outdoor unit, connected to an indoor Wi-Fi-enabled hub. But it will need power, either way. So either people need to run an electricity cable up the wall of the building, or drill a hole for a power-over-Ethernet cable between them. And install the outdoor antenna on a bracket (like satellite dishes of yore). Not self-install, and not great if you live in an apartment or rented house." Note the reliance on Wi-Fi – still. Huawei is the only phone maker we can think of who performs a sanity check, switching your connection from a slow Wi-Fi link to a faster cellular connection. The entire industry needs to do the same – in both directions.